We have reached the top-five. And, if you’ve been keeping up with the series, you’ll know that four of those five guys belong to the Husker offense. We’re about to get all fast up in here. Up first is Williams, a guy that received a scholarship offer from Nebraska on Jan. 7, committed three days later and was in class a day after that. Talk about on-brand. Did you ever feel his wrath? Ever wish you were part of the show? Buy your Mike Williams stock. Buy it now. (It’s still going at a reasonable rate after just three catches for 18 yards in the April 21 spring game.) As a freshman at Georgia Southern, Williams had three catches. As a sophomore last year at East Mississippi, he had 30 and seven touchdowns at a 23.2 yards-per-catch clip. If that doesn’t scream #PlayMak6r I don’t know what does. The first-year Husker probably doesn’t touch 600 yards this season with Nebraska; there are too many other mouths to feed around him. That’s what makes him exciting, though. I’m excited about what kind of damage a primary option-caliber receiver can cause as a secondary’s third- and sometimes even fourth-biggest priority. The same can be said for Tyjon Lindsey and Jaevon McQuitty as well, but we’re focusing on Williams here. (Man, how things have changed since the end of 2017 when receiver depth was a serious concern.) When you’re so focused on not letting Stanley Morgan Jr. kill you or JD Spielman break free, a guy like Williams could be like that kid at the gym no one really pays attention to until he starts raining 3s in people’s eyes. His wideouts coach, Troy Walters, started paying attention a while ago. And when you look at his resume that feels like a pretty safe bet to make. He has committed to the weight room since getting to campus and bulked up his body, so there’s one point. He’s not your typical newcomer, bringing with him Division I experience from a 2015 season with Georgia Southern (they played at West Virginia and at Georgia that season) and national championship pedigree (East Mississippi won the NJCAA title last year), so there’s another point. As spring ball started to wrap up, head coach Scott Frost saw Williams start to cut things loose a little more and “shoot his guns,” to borrow an oft-used phrase from the staff. So he’s getting comfortable, another point for Gryffindor. If Williams can translate all that goodness to the field right away we could be talking about a pretty special receiving corps. I’m not sure how much passing will take place this season — though it certainly figures to be less than last year — and given we don’t know who the quarterback will be (or the fact that whoever it is will have as much in-game experience at this level as Tim Miles’ dog, Sammy) it’s probably smart to keep expectations low in terms of numbers. But two of the Huskers’ top four pass-catchers from a season ago are gone. Who’s to say Williams doesn’t find a role while Morgan and Spielman open up the field. He almost had one of those big plays in the spring game when he burned corner Tony Butler on a go-route. Quarterback Tristan Gebbia underthrew a touchdown and Williams still managed positive yardage out of it, picking up a pass interference call while waiting for Butler to catch back up to him. 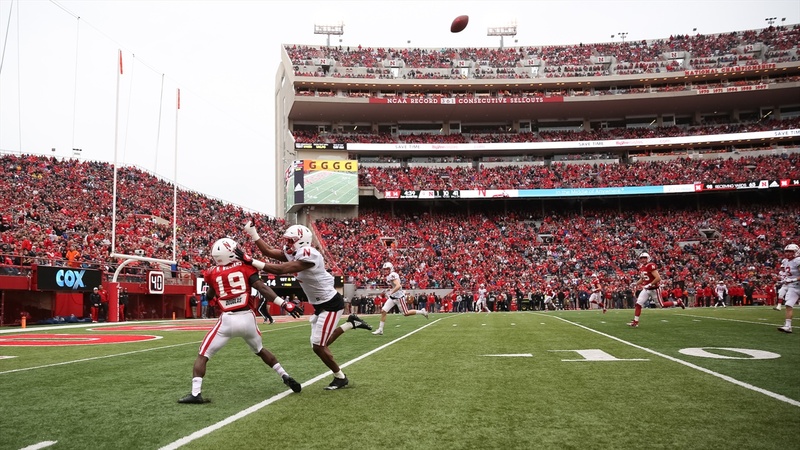 Back to last season, there were 49 explosive pass plays total for the Huskers; 49 plays that picked up over 20 yards. Fifteen of those graduated. That’s 31 percent. That’s a pretty decent-sized opportunity for someone to step into. Williams has the speed, the size (he’s 5-foot-10, 175 pounds and pretty much exactly the kind of athlete this staff wants) and the physicality to be able to find success in this new Nebraska offense. He has the chance to do it right away, too. Color me intrigued.